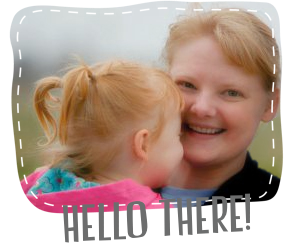 I'm back to blogging...April Fools! Just kidding, I am back to blogging. March began with doing taxes and finished with putting our rental house on the market. I'm so glad it's April! It feels like new beginnings, even though it seems like the winter rains just arrived in Northern California. I guess it's April showers. In the midst of painting and scrubbing grout, I did a little sewing in March. The youngest ginger decided to start sitting on the potty all by herself. So, I made some training underwear for her. It felt good to use up leftover PUL and bamboo terry from my cloth diaper making days. I'm procrastinating on actually beginning potty training. Ginger #2 seems ready. I, on the other hand, am not. Wish us luck in advance! I hope to finish the quilt top by the end of this week. As part of ALYoF, March was an epic failure. However, I have big plans for April as my sewjo returns. I'll be finishing Quilty Fun and the Hugs & Kisses quilts. Good luck with potty training! I'm still a little ways away with my 13 month old. 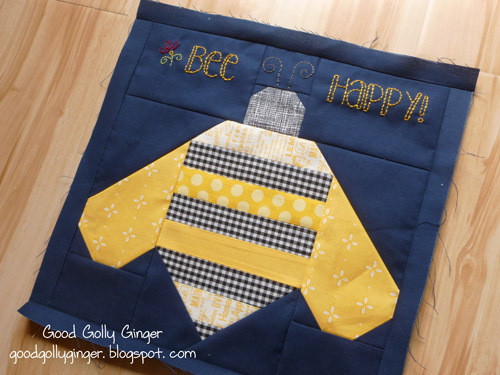 The bee block is adorable! Visiting from Fresh Sewing day. I love the bee block. And those trainers are a great idea--I have a ton of PUL fabric that has nowhere to go. Thank you! I still have more PUL, and I don't know what to do with it. Splat mats, aprons. I need more ideas! Thank you for stopping by. I have been participating in the Quilty Fun Sew Along as well. Your bee block looks great. I love the navy background. That would make a cute fat pencil! It would be easy to make too. Thanks for stopping by. I followed the trimsie pattern. It was much quicker making trainers than cloth diapers, and there are fewer snaps since it doesn't have to be adjustable. Thanks for stopping by!